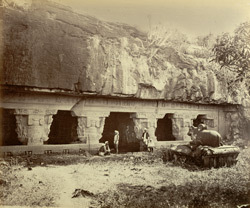 Photograph of the façade of the Ramesvara Cave at Ellora from the 'Lee-Warner Collection: 'Bombay Presidency. William Lee Warner C.S.' taken by J. Johnston in the 1870s. The site of Ellora is famous for its spectacular series of Hindu, Buddhist and Jain cave temples excavated into the rocky façade of a basalt cliff. The works were carried out under the patronage of the Kalachuri, the Chalukya and the Rashtrakuta dynasties between the sixth and the ninth Centuries. The Hindu cave of Rameshvara dates from the late sixth century and is famous for the beauty of its sculptures. This view shows the entrance of the cave. In the centre of the courtyard, there is a sculpture of Nandi, Shiva's bull, seated on a plinth. The verandah behind is elaborately adorned with sensuously carved female figures. They are placed on the brackets either side of the verandah columns.